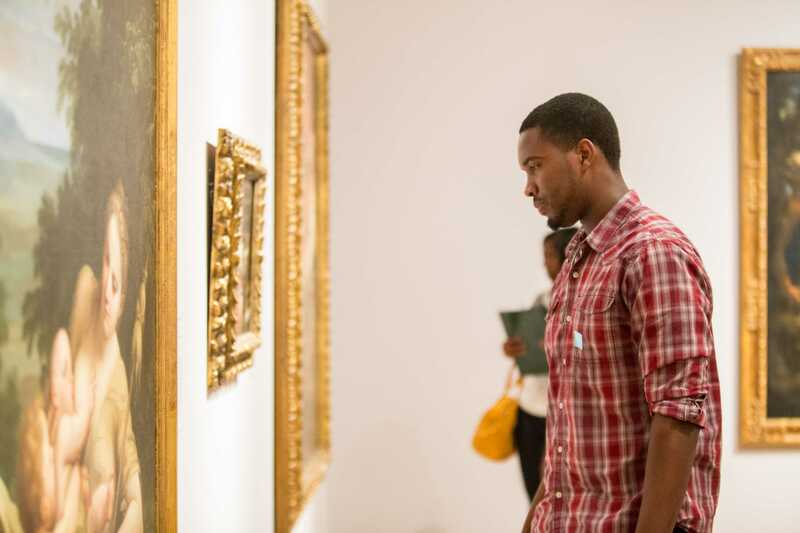 The Museum invites all K-12 audiences to engage in and explore the Norton collection through themed tours that connect to Florida Sunshine State Standards. All learning levels welcome. We look forward to seeing you and your students at the Norton! School tour reservations must be made at least three weeks in advance. Make a reservation by calling 561-832-5196 X1154 or e-mailing [email protected]. Tours are free for all school groups. Free busing for school trips to the Norton is available for PBCSD schools. Call for details. All tours are docent-led. However, middle school and high school teachers can self-tour the Museum Collection if they schedule at least three weeks in advance. Your tour is not booked until you receive a confirmation e-mail from the Museum. Along with the confirmation, you will receive details about your tour and advance materials to use in the classroom before you visit. Arrive and check in 15 minutes before your scheduled start time. Tour times are at 10am, 11am, and 1:30pm. The maximum group size per time slot 80 students, depending upon the tour and availability. One chaperone for every 10 students is required; a maximum of two chaperones per every 10 students may accompany the group. If more chaperones are necessary due to your students’ needs, please share this information at the time of booking. There are designated areas in the Museum garden for lunch, please reserve space when you book your tour. In the event that you must cancel your visit, please email [email protected], or call (561) 832-5196 x1154 as soon as possible. We cannot extend your guided tour because of late arrival. Please call (561) 832-5196 x1154 to reschedule your visit. If you do not see an appropriate tour for your students, call the Education Department at (561) 832-5196 x1154 to discuss your alternate idea(s). Teacher and professional development opportunities are also available through the Education Department. What does it take to truly see a work of art? Students practice critical thinking skills and connect with works of art by looking closely, learning new vocabulary to describe what they see, discussing points of view, and discovering personal connections. Students come to understand the Museum as a place for learning and fun. Teachers may request an Extended Tour, allowing for an extra hour of making art in the Museum classroom. In every culture, visual artists tell stories through art to share knowledge and viewpoints, and to inspire others. This tour features works of art from the Bronze Age to today, and builds understanding of how artists tell stories using color and line, pose and gesture, setting and symbolism. Teachers may request an Extended Tour, allowing for an extra hour of making art in the Museum classroom. Cultivate creative thinking and enhance STEM curriculum though the Norton’s STEAM tour. Students make connections between the arts, math, and science through careful observation and discussion. Students explore the architecture of the Museum and original works of art from the Bronze Age to the present. Teachers may request an Extended Tour, allowing for an extra hour of making art in the Museum classroom. Nina Chanel Abney creates vibrant, powerful works that appropriate pop culture and art history to explore issues such as race, gender, and politics. The tour also features work by other contemporary artists who address social and political issues. Teachers may request an Extended Tour, allowing for an extra hour of making art in the Museum classroom. This seventh exhibition in the RAW (Recognition of Art by Women) series is made possible by the continuing generosity of the Leonard and Sophie Davis Fund/ML Dauray Arts Initiative. Campers will use their powers of observation as they tour the Museum’s galleries and garden, then use their creativity and imagination working with Museum teaching artists on a hands-on art project in the studio. Designed for children ages 5-13. Each session is limited to 40 campers. One chaperone per 10 campers is mandatory. Admission is $5 per camper. This program was made possible by the generosity of the Itto Willits Charitable Foundation, with additional support provided by The William Randolph Hearst Endowment Fund for Education and Outreach Programs.